Since the new update this is not how to subscribe to a friends status, can you please tell me how?????????? Go to your account settings, Click on Mobile, It will have a “Whose status updates should go to my phone?” and under it it will let you add od delete Subcriptions. please could you tell me how I could change how to un subscribe via sms friends or change who I want SMS with? please tell me the steps please or where to go? Why is there a 50 friend limit on subscriptions now!?!? I haven’t turned off my “subscribe via SMS” options and neither has my little brother. So why can’t we see the option on each other’s facebook pages, or a lot of our other friends’ pages as well? how can i get my facebook messages and pokes to send through to my mobile? what happened to “Subscribe to SMS updates”? and why arent i recieveing them anymore? what exactly can people who subscribe to you via sms view about your profile? like statuses only, or can they see when you post something on someone else’s wall, photos, etc. and can they see when you delete things from your own wall? 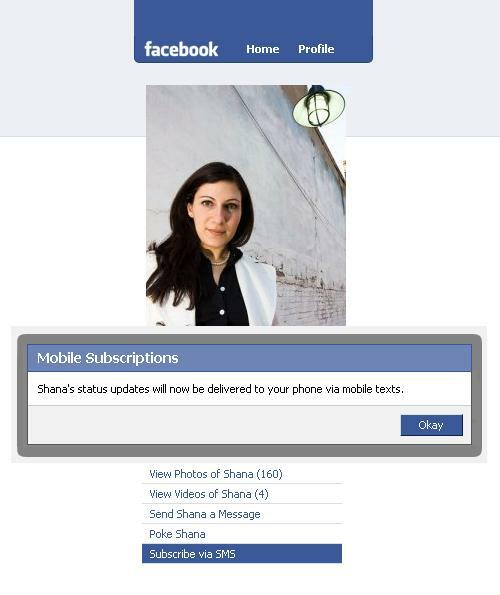 Claudia, they will only receive your status updates by SMS. Hope that helps! How can I add an existing friend to sms if I didn’t do it when I added them? My boyfriend has his privacy settings set to allow friends and friends of friends to subscribe to his status, yet i am still unable to subscribe to his status. Help Please! What if I dont want to receive status updates from a person, currently I hv subscribed to? P.S I am talking about those persons, whom there is no option under their profile link, near to unfriend and report etc. If you had someone who got your status to there phone..
but then you blocked them on fb will they still get your statuses? @ Guesy Obviously, they wont get any update. It is as like as they dont exist on Face Book for u. But the question is , how to unsubscribe from your friend’s update without blocking and/or re-friending them. is there a way to block people from subscribing to my statuses on their mobile phone? How do I unsubscribe to an SMS? how do i delete all my subscriptions to start new? how can i stop someone from subscribing to my posts via sms? what if i can see status updates to my friend but i cant subscribe via sms ? is their anyway to get my daughters statuses sent to my phone via text message? This option seems to have gone away. What a bummer! After I put the subscribe buuton on my profile must my friends go to my profile and push the button to see mu posts????? If I accidentally unsubscribe to status updates via SMS from a page, it takes the option away completely. Is there a way to go back & subscribe via SMS? How can I sort my game “friends” from my friends on facebook? Is there a way to see what photo my friend comments on Via SMS without logging onto Facebook? How can i UN-SUBSCRIBE from receiving a person’s statuses????? I am subscribed to my friend thru text alerts on fb. I do not receive any texts from facebook I unsubscribed and resubscribed and still dont get them. I go to my account setting an go to mobile an than notifications an it don’t show me a place where I can add people or even see the people I have I have not got any messages to my phone status updates messages anything please help. is this option available on timeline???? i subscribed to someones’s statuses a long time ago for a friend to keep an eye on them, no i want to stop getting their statuses sent to my phone. How can a do that? I want to subscribe to my son but I don’t have a cell phone to be able to subscribe via SMS and when I go to his page he says to subscribe to him but I can’t find WHERE I am supposed to do that…..H E L P !!! How do you subscribe or unsubscribe to somebody’s status on the new Facebook? And the mobile iPhone app? how do you do it on a timeline though?? I would like to subscribe to specific facebook friends but I dont see the subscribe button on their page, how can this be rectified. when i subscribe someone facebook (not friend), i can see their update. can they see my update too? i set “only friend can see on my facebook”, so if i only want that person that i subscribe can see my update, can i do it. thank for answer my question. If a friend changes his profile pic, can i get a sms notification for this on my mobile just as status update. How do I add someone to my fb status via SMS?